Remember BumpTop? We covered a tech demo of the 3D desktop technology back in 2006 and felt that it could be a great way of helping computer users bring order to the their computer desktop. Unlike other projects of this kind, this one was developed into a product that is now available as a free and pro version for the Windows desktop. 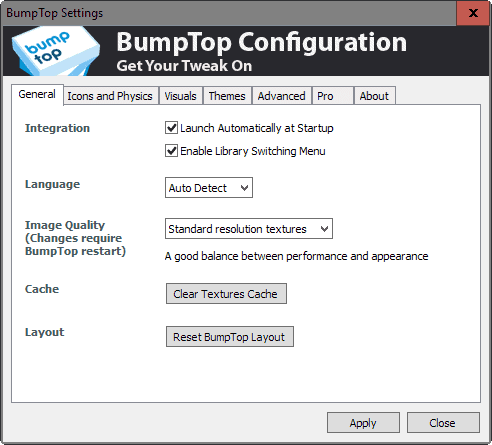 BumpTop replicates the look and feel of a real world desktop to the operating system. It looks pretty much like a three dimensional room on the computer screen. Elements on that new desktop are easier identified as their standard Windows desktop counterparts because of a few techniques like displaying a thumbnail image of photos instead of an icon of the image format. File previews are not limited to images only though. BumpTop will also display the contents of Spreadsheets, PowerPoint presentations or PDFs directly on the desktop, and since you can zoom, it is easy enough to identify documents and files on first glance. Icons can also be piled up on the BumpTop desktop easily. 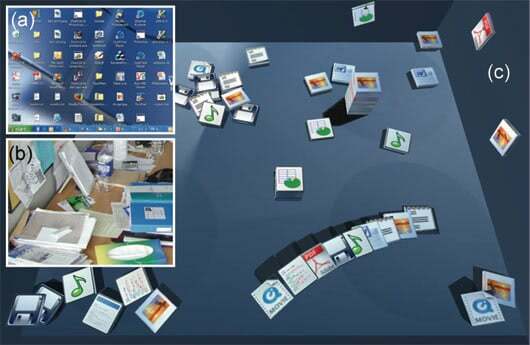 It is for example possible to create a pile of all Word documents or photos on the desktop. They can also be fanned out quickly to see what files it contains. The pro version adds flipping through the pile with the scroll wheel to that. Icon sizes can be altered manually to give them more room on the desktop which makes it easier to identify them. The pro version will grow popular files automatically so that they can be distinguished and accessed quicker. The search as you type feature will identify matching icons on the computer desktop instantly and it only takes the enter key to open them. Other options include sorting them or bundling them together no matter where they are located on the desktop. Icons can also be tossed around or pinned to walls. Tossing icons around on the desktop applies to interfaces as well. Tossing a document on the printer will print it while tossing a photo on the Facebook icon will upload it to the web portal. Facebook, Twitter and Email are currently supported by BumpTop. Several other features can be accessed like adding photo RSS feeds to the desktop or utilizing the capabilities of touch-screen interfaces. BumpTop is fun to play around with. It does take some practice to get used to the new interface though. It is a well thought out Windows desktop alternative. Update: Bumptop has been acquired by Google in 2010. The product has been discontinued as a consequence. Update 2: Surprise, surprise. Google released BumpTop as Open Source in 2016. You can download a copy of the program and its source code from the new website. The new version brings the 3D desktop to Windows once again. It works best on touch-supporting devices but supports mouse and keyboard use as well. The app starts with a tutorial that explains key concepts such as zooming in and out, moving items around or launching them. The settings let you change core features of the program. This includes switching between different themes BumpTop ships with, using images to change the appearance of the walls of the desktop, or switching to high or low resolutions to look better or improve performance. Please note that the program sets itself up to start with Windows automatically, and that you can disable that from within the settings as well. It does not seem as if BumpTop has been updated ever since it was acquired by Google. Indicators are that the program settings link to the now-defunct old homepage of the project, and that users of the program can upgrade to the Pro version from within the settings as well (which does not work because the old server and website is no longer available). BumpTop is still interesting as a concept even after six years of project inactivity, and the release of the source code may result in forks or updates for the 3D desktop program.Ultimately though, it is too little too late for the program. Seems cool. But how much does it slow down start up and processing I wonder? Pointless! Why the hell would you want to use a computer like that unless you were using a touch screen! This is amazing. And to the previous poster…why wouldn’t you? There are so many things that this does that makes it amazing. – Preview of PDFs and images right on the desktop! – Has a more fluid interface. Something that’s lacking with Windows. Don’t call it pointless. I think this would be even better if it were used on a touchscreen device, but I think it’s an incredible improvement even on non-touchscreen computers.